Winter has its charm, with a world covered in white. Spring lures me in with the green seedlings of new life. Summer romances with vibrant colors and fragrances from exotic places, but autumn will always hold the colors to my heart. The fading of green leaves into muted tones of yellow, orange, red, and purple is one of the most fascinating transitions to watch. I fear that their time is coming to a close in the Midwest. The colors of the leaves have now dimmed further still and their luster is lost as they fall gracefully to their rest among the cracks in the sidewalk. I can only wish the colors would linger longer. I don't think I've yet had my fill. The weatherman is talking of a snowstorm this weekend and I'm not ready to give in to cold winter just yet. When I sat down to photograph this oatmeal before breakfast last weekend, I couldn't help but notice something strange. Though I typically choose to shoot food in the late afternoon autumn sun (I love the long golden rays and the charm it lends), this day was an exception. At first, I thought I had accidentally left the overhead light on (since I photograph food exclusively in natural light, this would create a problem for me in terms of shadows and white balance—the food never looks as vibrant or real). But, as it turns out, I hadn't. I looked around for another source, but came up empty handed. It couldn't be, I thought. Is the autumn sun really flecked with gold in the morning light? And, if you look at the picture below, I think you'll find it's true. When you next have a moment of time to enjoy the morning sun, I hope you'll sit down to a bowl of this apple cinnamon oatmeal and watch as the autumn sun turns your bowl into flickering golden lights. 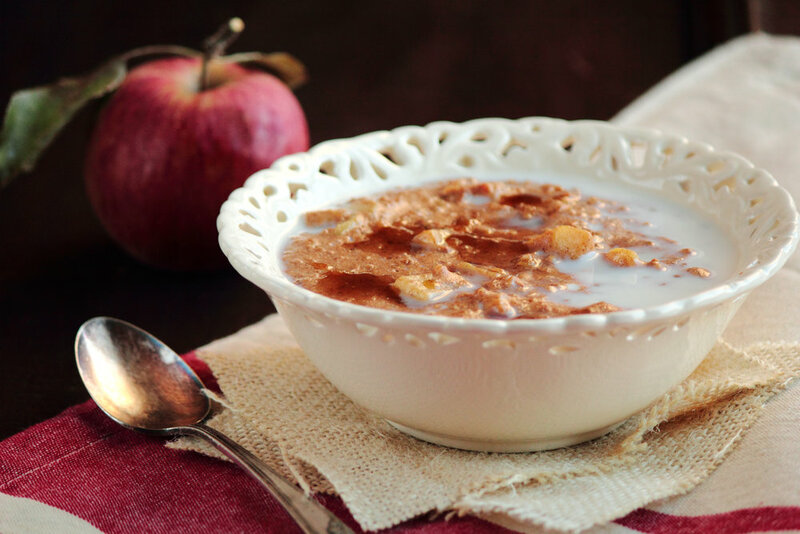 This Apple Cinnamon Steel Cut Oatmeal makes for a hearty, comforting breakfast. Steel cut oats, unlike traditional oats, are a less processed version. They are full of texture (long gone are the days of mushy oatmeal) and I find the oats to be heartier and more filling. Apples and cinnamon are a classic fall flavor combination. The apples lend a sweet taste and soft texture to this oatmeal while the spices round it out, bringing the flavor closer to that of a good apple pie. In a medium saucepan, heat together milk, steel cut oats, diced apples, brown sugar, vanilla extract, and spices over medium-high heat until boiling. Once boiling, reduce heat to medium-low and simmer for 20-30 minutes, stirring occasionally, until desired oat texture is reached. Remove from heat. Serve with a splash of milk and extra brown sugar for sweetness.